The Indian $5 Half Eagle is widely regarded as one of the most beautiful and innovative of all United States coins. It, along with the $2.50 Indian of the same design, was the first US coin to display an incused or “sunken” design. Despite initial concerns about its ability to collect germs and grime, it became a successful and widely circulated issue. 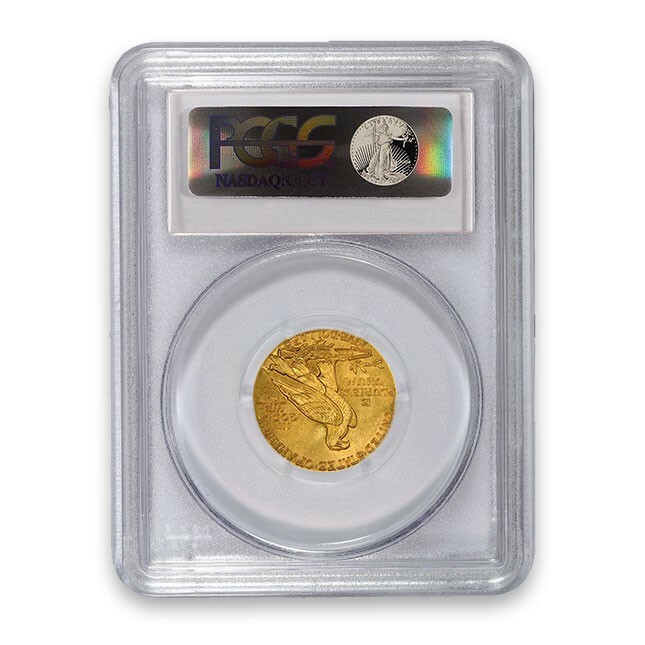 From 1839 through 1908, the $5 Half Eagle design went essentially unchanged. The venerable Liberty design (aka the “Coronet” motif) had remained in place for decades without any substantial modification. Other than the addition of “In God We Trust” on the reverse, there were no meaningful adjustments or refreshes to the design. Theodore Roosevelt lamented that America’s gold coinage had become stale and uninteresting. With that in mind, he commissioned Augustus Saint Gaudens to overhaul our $2.50, $5, $10 and $20 pieces. As many numismatists know, Saint Gaudens was able to complete his proposed designs for the Eagle and Double Eagle, but tragically passed away before he could tackle the other denominations. President Roosevelt then turned to Bela Lyon Pratt, an American sculptor and protégé of Saint Gaudens. Roosevelt knew that Pratt would be inventive and creative like his famous mentor. True to expectations, Pratt’s proposed design for the $2.50 and $5.00 coins were truly unique. In complete contract to all previous US coinage designs, his prototypes called for flat raised fields and sunken design details. Such a format had never been tried on an American coin. Roosevelt was enamored with the design, but the general public had a different take. Many citizens were concerned that the coins would accumulate germs and dirt; grime would get lodged in the sunken areas. Some bankers even worried that the coins would not stack properly. Both concerned proved false; the coins enjoyed tremendous usage and success. The denomination was put on hiatus in 1916, as surplus quantities minted from 1908-1915 were still lingering in the financial system. A small number of pieces was made in 1929, but then the denomination was discontinued altogether with Franklin Roosevelt’s gold coinage ban of 1933. Ironically one Roosevelt created the denomination and another ended its run. Today, $5 Indians are extremely popular collectibles. They are relatively easy to find in AU and lower Uncirculated grades, but can become extremely scarce in MS 65 and above. The rarest dates are the 1909-O and 1929, which both typically sell for well over $10,000. 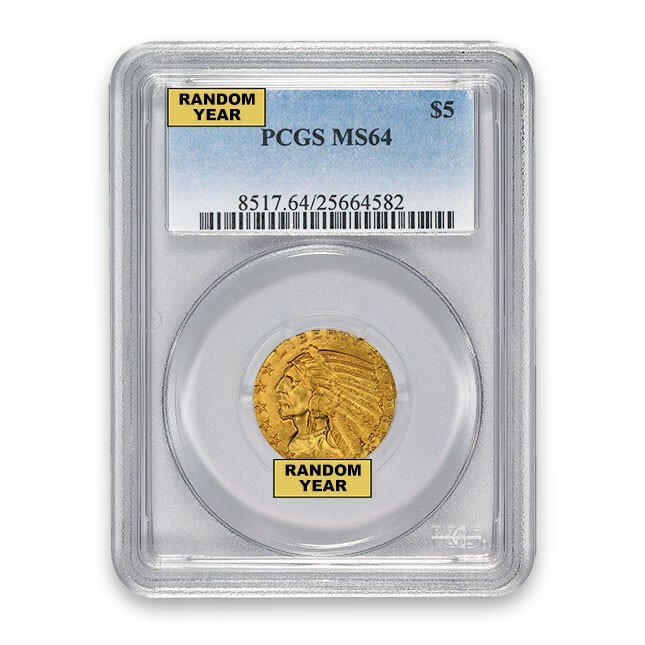 Perhaps the most valuable $5 Indian is a 1909-O graded MS 66, which has sold at auction for approximately $750,000. Best Prices On $5 Indians!